Well, we had an AMAZING time. What a brilliant country. I'd probably say among many highlights, the best surprises were: - Peruvian food. We had no expectations whatsoever really - we went to Cuba a few years back, and whilst the country was fantastic the food there was pretty ordinary, and if anything we assumed Peru would be similar. But the range, quality and distinctiveness of what we found in Peru was amazing. The relative cheapness meant we were able to 'splurge' at really nice restaurants a number of times, which was great - but even the food at buffets on tour/coach trips and on the Inca Trail was excellent. We're on the hunt for a good Peruvian cookbook now! - Arequipa and (particularly) Cusco. Beautiful cities - and in the latter case, probably one of our favourite ever anywhere we've been. - The Tambopata Research Center. Thanks so much for organising a longer stay in the jungle with a trip to TRC as well as Refugio Amazonas. Both were great - but the time we spent at TRC, with fewer other tourists and lots more rare wildlife, was really outstanding, not least thanks to our guide Jhin (much more about him below). Both of us - but particularly Clare, I know - loved the working/research nature of the place and the more in-depth contact with the wildlife. - Colca Lodge. Thanks for the heads up, which as far as I could tell went down very well indeed. With regards to our guides/organisation, everything - pretty much without exception - ran like clockwork: we were picked up in every place, never had to wait or were left wondering what to do (even though having travelled independently a lot before we occasionally fretted needlessly). That's about it - if 'it' can cover what an amazing trip we had...I hope that's useful. 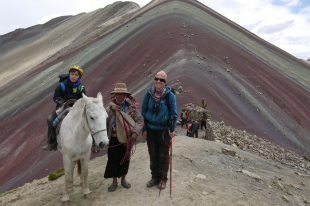 Needless to say, we're very happy indeed with Andean Trails and we'll be recommending you to our friends and family. By the way, you might be interested to know that the things that initially really sold the trip over other agencies were: - the really detailed level of information you provided at the initial enquiry, esp the info about Tambopata and the Inca Trail. - the fact that the trip was planned to slowly acclimatise to altitude from Arequipa to Colca to Lake Titicaca to the Trail, before ending with Tambopata; this confused us originally because so many other tours (bespoke and non-bespoke) seem to have other routings - e.g. going straight to the Inca Trail after a night or two in Cusco - but your itinerary in retrospect made perfect sense, and ending with the jungle was the icing on the cake. Thanks very much again, and who knows? We might be in touch again regarding another South American trip in the future. We reckon Canada next year though..